The first set started evenly, with a 5-5 score through the first ten points. 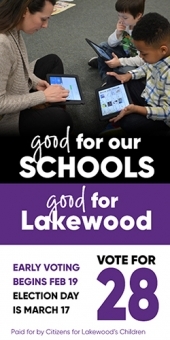 Then Lakewood went on a 9-1 run to make it 14-6. They kept the lead, closing it out for a 25-15 win. Valley Forge took an early 7-4 lead in the second set, but the Rangers caught fire with an 11-3 run to take a 15-10 lead. The Patriots took command at that point, going on a 9-1 run to regain the advantage. Lakewood tied it at 23 apiece, but Valley Forge won the final two points to take the set 25-23. Lakewood dominated early in the pivotal third set. They took leads of 8-3, 12-4, and 19-5. Valley Forge attempted to make a comeback, but the Rangers prevailed 25-16 to take a 2-1 lead in the match. The fourth set started evenly, with the teams tied at 5-5, 10-10, and 13-13. The Rangers took a 16-13 lead before the Patriots tied it again at 16. 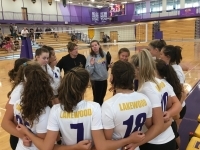 Lakewood then went on the decisive run of the game, closing out the match with a 9-2 run to prevail 25-18. When the final point happened, the home crowd erupted in cheers. Happy Rangers stormed the court to celebrate the win, and there were high-fives and hugs all around. The win ended a frustrating streak for the team, which worked very hard this offseason to improve. The Rangers finished third overall at an offseason tournament at CWRU, and finished first in their pool at another offseason tournament at Kent State. They were especially motivated to win in their new gym.